The Virginia Wine Industry lost one of its most enthusiastic promoters earlier this year. 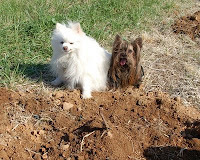 On September 10, 2012, Munchkin -- the irrepressible Yorkshire Terrier of Virginia Wine Dogs fame -- crossed the Rainbow Bridge to tend heaven's vineyard. Munchkin got her first taste of the grape en route to the mountains for Columbus Day Weekend in 2004, making a chance stop at what was then known as Virginia's first vineyard, Farfelu Vineyards (French for eccentric or hair-brained -- like the idea of a pair of pups having a wine blog?). Her last visits took her to the opening of BOW's Oak Hill Estate and to wine club events at Keswick and Rappahannock Cellars followed by a spontaneous stop at Little Washington Winery. 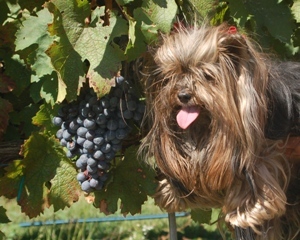 The great-great-granddaughter of the venerable CH Cede Higgins (the only Yorkshire Terrier ever to win "Best in Show" at Westminster), Munchkin brought her natural flair for showmanship to tasting rooms across the Commonwealth. She delighted in entertaining winery guests -- all the more when her dancing, twirling, rollovers and other tricks were rewarded with treats. 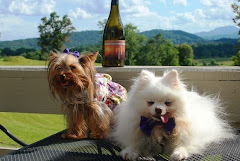 The jumping off point for Munchkin's wine adventures was a mountain retreat just minutes from Fox Meadow, one of several new wineries opening in the Blue Ridge during the first decade of the 21st Century. In 2007, Munchkin teamed up with Pomeroy (Pomeranian and photographer extraordinaire) to create the Virginia Wine Dogs blog, making it their business to sniff out Virginia's finest. 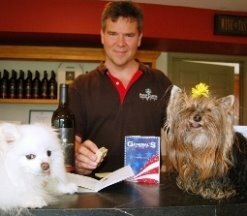 Over the years, Munchkin faithfully reported barking wine news on her blog and Facebook page, spreading the pawsitive word about Virginia's fast-growing industry and its rising reputation as a top wine destination and producer. She was on hand as a Rovering Reporter when the North American Wine Bloggers Conference came to Charlottesville in 2011, earning a spot on VAWine TV. and even took a turn at bottling at Breaux. 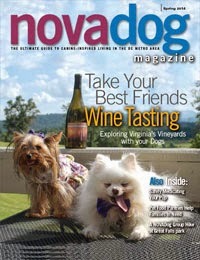 Munchkin's credits include features in Northern Virginia Magazine, NoVA Dog, and Our Town and on NBC 29 (Charlottesville). 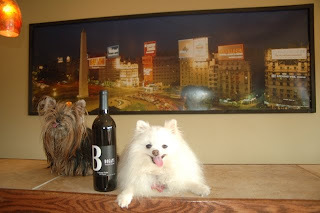 Munchkin's loved ones are keeping her spirit alive through her wine blog and Facebook Page. 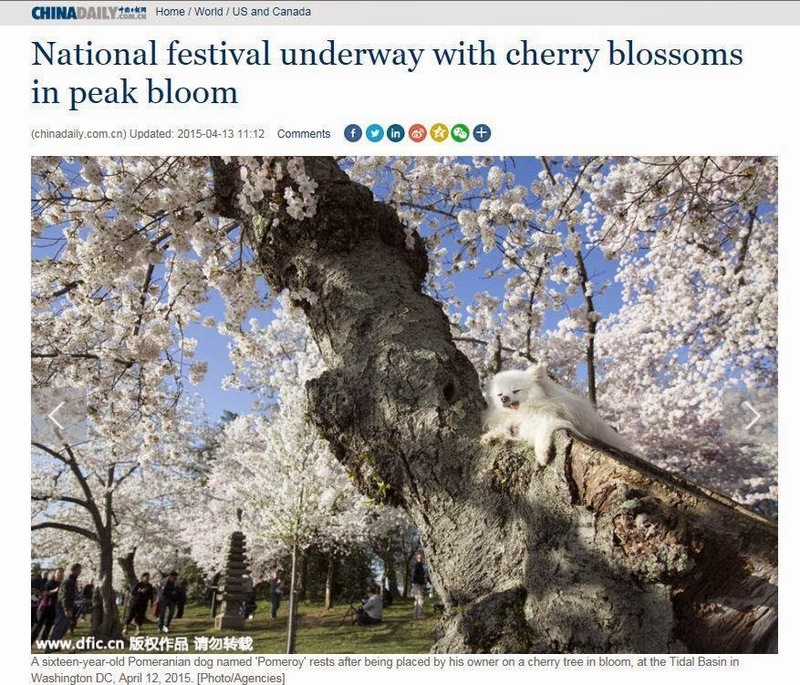 Several as yet unpublished Wine Dog reviews from past years have been located, so fans can look forward to new adventures in the months ahead. 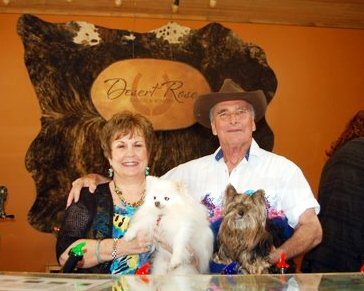 Desert Rose Winery celebrates its first anniversary this weekend (March 31). Shortly after it opened, Munchkin and Pomeroy moseyed out to the ranch and saddled up. 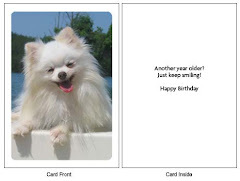 This is a unique property – reflecting the life and heritage (and humor) of its owners, Bob and Linda Claymier. Bob hails from high desert country in Oregon. The horseshoe on the Desert Rose logo, the calfskin on the walls, saddles and hay even bales are a tribute to Bob's cowboy roots - many of the artifacts are old family heirlooms. The tasting bar reflects other aspects of Bob's life - his career with a federal agency that took the Claymiers all over the world. At every stop, Bob and Linda collected currency, now serving as the counter Desert Rose's "million dollar bar" - one of the only places where Israel and Iraq sit peacefully side-by-side. In Greece, Bob and Linda met Louis Papadopoulos, who later emigrated to the United States and, showing just what a small world it is, today runs a neighboring Fauquier County winery - Mediterranean Cellars. 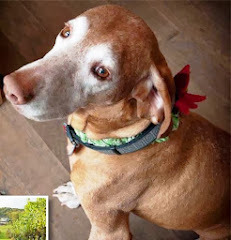 Bob told the Wine Dogs that the wonderful thing about the wine industry in Virginia “it is such a collegial group - giving a “hats off to John [Delmare] and the entire group at Rappahannock" Cellars. Before buying his own property, Bob used to come down and help Dirgham Salahi at Oasis. 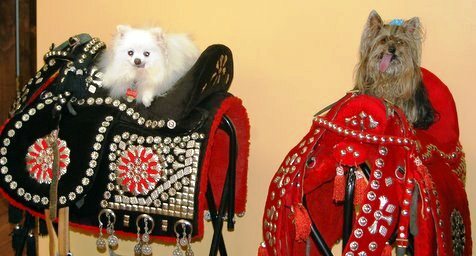 Munchkin and Pomeroy are pleased to report that, as a ranch, Desert Rose is an animal property and pet friendly inside and out. On the day of the Wine Dogs' visit, they were hosting a benefit for the Fauquier County SPCA. In addition to four-legged friends looking for new homes, Munchkin and Pomeroy met Gigi. The adventurous senior dachshund, owned by Bob's brother Ken, has hung up her tiny motorcycle hat and leather jacket and settled in comfortably to life as a winery dog. 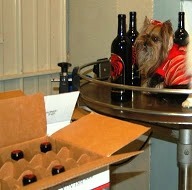 The Wine Dogs also met daughter Kris and granddaughter Emily, who helps out at the family winery. Kris recalls what it was like to grow up with a homewinemaker for a father. "Some of my earliest memories are smelling the yeast coming out of the basement as the wine was percolating.” adding that “Dad would make wine out of anything – even dandelions." Today, Bob makes his wine out of grapes grown primarily on the property or under his supervision (although the Port-like Starboard is aged in whiskey). Ole Moo Moo - named for the ranch's celebrity cow and blizzard survivor. 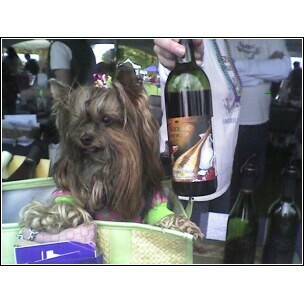 Munchkin gave two paws up to the off-dry white made for Linda, who is not a fan of dry. Sparky (picture of the power line since part of land was claimed by Dominion Power) is a Rose produced from bleed off from a blend of Cab Franc, Merlot, and Cab Sauv. R.E.D. is named for Bob – Retired and Extremely Dangerous (check the label for more hints about that government agency). The chambourcin is a little spicy with a very distinctive finish. And a simply named Cabernet Franc, which Pomeroy's decided was the pick of the litter. Desert Rose produced 1,000 cases its first year and is looking to expand slowly, but not too much. "About 2,000, I get out of my concept of a boutique winery," Bob says. But then again, Bob describes the winery as "a hobby that got out of control." Representatives of the wineries producing the 12 highest ranking wines in the competition -- the Governor’s Cup Case. 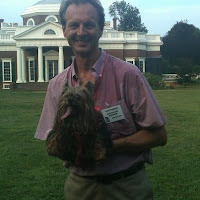 This year’s Virginia Governor’s Cup competition featured new rules and new honors. More than 400 wines competed;13 won gold. The 2012 Governor's Cup goes to the 2009 Hodder Hill meritage produced by Wine Dog Pal Jeff White, owner and winemaker at Glen Manor Vineyards in Front Royal. Jeff has two wine dogs of his own -- Chuck, a chocolate lab, and Sport, and American brit. Winemaker Jeff White pours the 2012 Governor's Cup winner, Glen Manor Vineyard's 2009 Hodder Hill Meritage. The Hodder Hill, along with the next 11 highest ranking wines in the competition will be combined in the Governor's Cup Case (actually 10 cases of each wine will be available). These award-winning wines will be used to showcase the best of Virginia's vines and vintners, including use by Governor Bob McDonnell on international marketing missions and other events to promote Virginia wine and winery tourism. 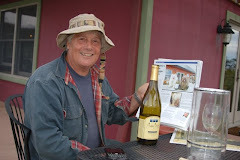 Lee Hartman of Bluestone Vineyard with his Gold Medal 2010 Cabernet Sauvignon. This new winery opened only 13 months ago and is off to a great start with a wine in the Governor's Cup Case. Delfosse Vineyards winemaker Paul Mierzejewski produced a Gold Medalist with the 2007 Meritage Blend. Ben and Chris show off Jefferson Vineyards' Gold Medalist, the 2010 Cabernet Franc. Known for creative blending, winemaker Andy Reagan added 10% tannat and 6% Lemberger to this Virginia classic with outstanding results. 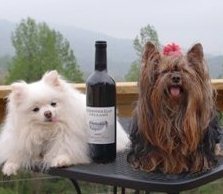 Owner Cindy Schornberg was doing double time with Keswick Vineyards' two gold medalists -- the 2010 Cabernet Sauvignon Reserve and the 2010 Merlot. These yet-to-be released wines, both 100% varietals, are already proving their pedigree. David King proudly displays King Family Vineyards Meritage, a Gold Medalist in the 2012 competition. The 2007 Meritage claimed the Governor's Cup in the 2010. 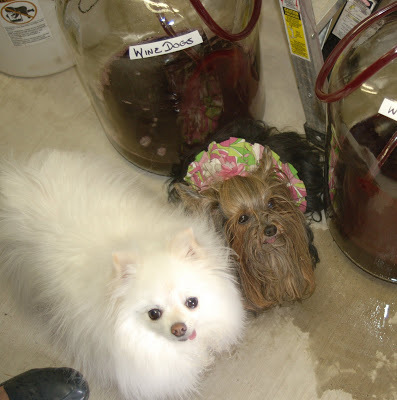 The Wine Dogs made their television debut when they visited the King Family Winery in 2010. Winemaker Simone Bergese produced Potomac Point Winery's Gold Medalist -- the 2009 Heritage Reserve. 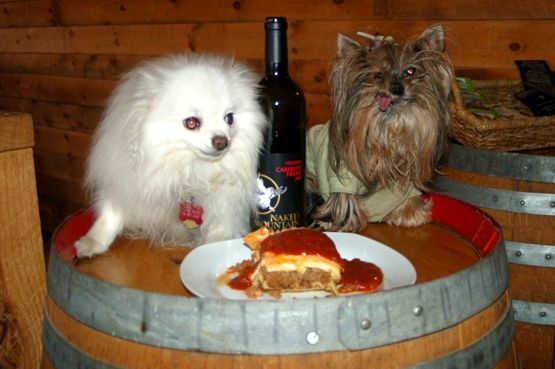 The Wine Dogs look forward to visiting this impressive, dog-friendly winery. Winemaker Jordan Harris produced Tarara's 2010 Honah Lee - a Gold Medalist that will be part of the 2012 Governor's Cup Case. A blend of Viognier, Petit Manseng, and Roussanne, this is a white red wine drikers will enjoy; warms you from the inside out. Patricia Kluge adds class to the Gala with an apertif, the Kluge Estates Cru. She is the founder of the winery that produced the 2008 Kluge SP Blanc de Blanc, a 2012 Gold Medalist and part of the Governor's Cup Case. Kluge Estates is now Trump Winery. Winemaker Emily Pelton produced a Gold Medalist at her family winery with the Veritas 2010 Vintner's Reserve, a meritage blend. Lisa Champ, whose famly started White Hall Vineyards 18 years ago, displays the Gold Medal winning 2010 Gewurtzraminer, one of only two whites to make the 2012 Governor's Cup Case. It was an evening of celebration as the results of the 2012 Governor's Cup competition were announced. The night's big winners: Glen Manor (Guv Cup), 1st Lady Maureen McDonnell (Wine Person of the Year), Lake Anna's Ann Heidig (Lifetime Achievement), Del. Scott Garrett (Legislator of the Year) + 12 Gold Medal Wines for Governor's Cup Case. Dr. Jeff Cooper (Cooper Vineyards) chaired the Governor's Cup Committee and served as the night's emcee. Virginia's Governor's Cup competition has been revamped and is now one of the most stringent and thorough wine competitions in the United States. Lake Anna Winery Founder (and Spottsylvania County Supervisor) Ann Heidig received Gordon Murchie Lifetime Achievement Award for her many years of exceptional service to the Virginia Wine Industry. First Lady Maureen McDonnell was recognized as the Virginia Wine Person of the Year. 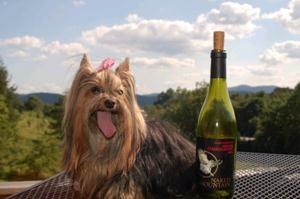 As First Lady, she has been a tireless promoter of Virginia Wine. VA Secretary of Agriculture Todd Haymore reads the proclamation declaring March "Virginia Wine and Dine" Month (so successful it's expanded from a week... mirroring the success and expansion of the Virginia Wine industry). Governor Bob McDonnell says one of the easiest parts of his job is promoting Virginia wines, which he has featured on international trade missions. "Just as Virginia wines have been gaining acclaim here and abroad, we have raised the bar on the competition," the Governor explained, including a requirement that all entries to be made 100% from Virginia-grown grapes. ﻿﻿﻿﻿﻿Winemakers representing the 12 highest ranking wines in the competition out of 400 entries. These wines will be combined in the Governor's Cup Case and used to showcase the best of Virginia wine. 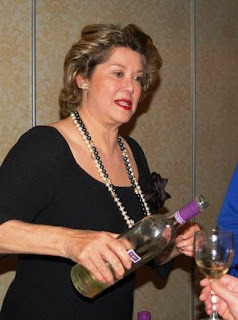 At the Governor’s Cup Gala on Thursday night, the Virginia Wineries Association recognized First Lady Maureen McDonnell as the Virginia Wine Person of the Year. She was introduced by Ann Heidig of Lake Anna Winery, who was recognized as the Gordon Murchie Lifetime Achievement Award winner. As First Lady of Virginia, Maureen McDonnell has been a tireless champion of Virginia wine, promoting. Her First Lady’s Initiatives Team Effort (FLITE) trips have brought press, restaurateurs and wine shop owners on tours of Virginia’s wineries and serves Virginia wines when she entertains. Governor Bob McDonnell, who was at the Gala to present the 2012 Governor's Cup, looked on proudly as his wife received this unexpected but well deserved honor. 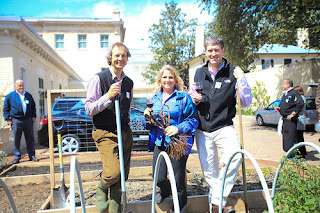 Last year, the First Lady planted 12 vines at the Executive Mansion in recognition of the 1619 12th Act of the Virginia House of Burgess, requiring every landowner in the Virginia Colony to plant and maintain at least 10 vines. She announced will be bottling Mansion Wine for the upcoming 200th Anniversary of the historic home of Virginia's governors. No need to let the cold weather put a chill on plans to explore Virginia wine country -- just named one of the top 10 travel destinations for 2012 by Wine Enthusiast magazine! 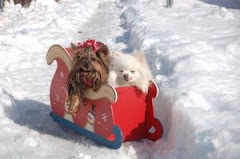 Munchkin and Pomeroy share their winter wining tips. 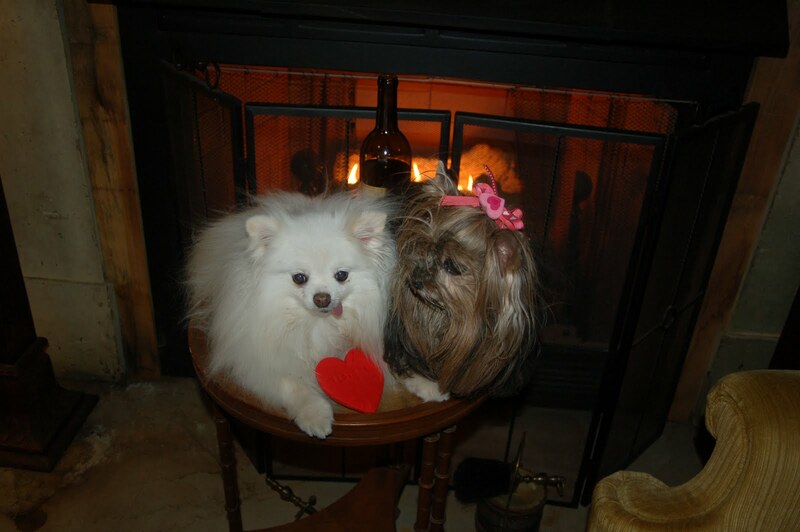 Snuggle up in front of a warm fireplace. So what if you don't have a warm fur coat like Pomeroy's. Grab a bottle of red and curl up in front of a crackling fire. 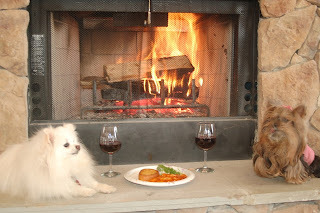 The Wine Dogs especially enjoy the blaze at Philip Carter's Cleave Hall (above) and love the homey atmosphere at Aspen Dale Winery at the Barn. A truly impressive fireplace can be found at Barrel Oak Winery , as well as generous arrangement of firepits outside (throw on your own logs) -- Munchkin and Pomeroy enjoyed both, along with a bottle of 2009 CabFranc, last weekend. Enjoy winter comfort foods with your Virginia vino. Several wineries have winter specials. The grandfather of them all is Naked Mountain's "Lasagna Lunch." The wonderful pasta sensation (sausage or vegetarian), layered with cheese and topped with a savory sauce, is prepared by Chef Eric and offered from January thru March. Pomeroy could hardly resist long enough to pose for the picture. The Wine Dogs give two paws up to new owners Randy and Megan Morgan for continuing this tradition. Pair with Naked's 2007 Cabernet Franc or 2006 Merlot. Also on the winter menu are Souper Sundays at Pearmund Cellars and Chili and Wine Time at Philip Carter. If you're a true Chili Dog, you won't want to miss the Chili Cook-Off Wine Trail Weekend, January 28-29, where you can sample chili at each of the four wineries along the Heart of Virginia Wine Trail (Cooper, Grayhaven, James River Cellars and Lake Anna)and vote for your fav. That's Entertainment! 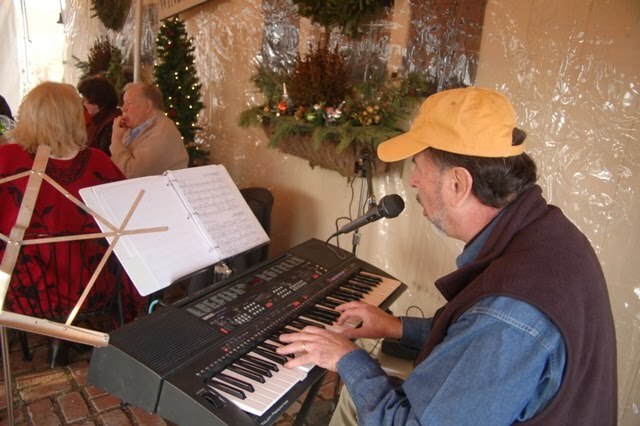 Live entertainment continues at Virginia wineries throughout the winter. Take in some of the more unique offerings next weekend with Three Fox's Cabernet Caberet (sing along with winemaker/pianist "Giovanni" and special guests on the winterized patio, 1/22) and the Laugh Sip and Smile... Saturday Night Live comedy night (1/21) at Bogati's Bodega. Many other wineries feature local musicians, such as Friday Evening in Paradise (Springs) as well as the winery's Live Music Saturdays. And of course, Munchkin's favorite wine trubador Robbie Limon is making the circuit at North Mountain (1/28, 2/12), Veramar (2/11), and Narmada (2/25). Virginia wineries are open - what are you waiting for?